After a long, hard week at work, Jonny and I usually try and treat ourselves on Friday nights, especially when the weather turns colder, to a drink and an indulgent meal. Ok, we don’t just reserve this for Fridays only, but for some reason, a drink and a meal always seems to just taste better when you know you don’t have to work the next day. Many Fridays we’ll meet at one of our neighborhood bars here in Brooklyn where we can catch up on the happenings of the day and relax knowing we have a full weekend ahead of us. We had been craving steak all week but told ourselves, we must wait until the weekend. After a martini at the bar, I was more than ready to sink my teeth into some medium-rare steak. We did not care about how much fat we were ingesting either, so don’t expect this to be a low-fat meal. Hey, come on! It’s FRIDAY. We deserve a little indulgence, right? Are we the only ones out there that like to (or are able to) indulge in a bit of extra wine/drink and extra fat in their meal? We’d love to know what your weekend indulgence is (even if it’s not food…). ***This is also really good on grilled chicken or pork. Just make more if it will be the main sauce for your dish. Rub your steak with olive oil and with the sliced garlic and a sprinkle of kosher salt on both sides. Let rest at room temperature white you make the rest of your stuff. If your butter is not soft, throw it in the microwave in a small bowl for about 5-10 seconds to soften. Using a good palmful of fresh tarragon, give it a rough chop and put in your mortar with a small pinch of kosher salt to aid in the smashing. Do your best to mash that into a paste as well. Again, scrape the bottom to get out all the delciousness and add that to your softened butter. Mix the tarragon/garlic butter so it’s all well-incorporated. Scrape out the green-ish butter on to a piece of plastic wrap. Shape it into roll, twisting the sides of the saran wrap so it looks a bit like a salt water taffy wrapper (hope this makes sense). Put into the freezer to set up. If you want to make the optional mushroom topping, saute your sliced mushrooms with the diced onions in the butter and a small pinch of salt and pepper. When soft, add your cream and let reduce a bit till the cream melds with the mushroom/onions and it becomes a thick sauce. Add your tarragon and stir. Turn heat to low and keep warm, stirring every once in awhile. Heat up your veggie oil. Cut your potatoes and mix your seasoning salt. Heat up your grill pan so it’s VERY hot. Fry your potatoes once, till they take on just a bit of color. Take out and let rest. Fry them again until golden brown. While your fries are frying one more time, grill your meat for 2 minutes on each side. Take off the grill, sprinkle the top with some sea salt (I’m telling you, it’s amazing and it melts into your meat) and let rest white you finish assembling. Take your double-fried fries out and let drain. 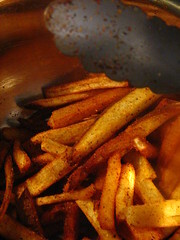 While still hot, add your fries to a bowl with the seasoning and toss so they are all coated. Plate up. Take your compound butter out of the freezer and slice a 3/4 of an inch slice and top your warm steak with it. It will melt all over. 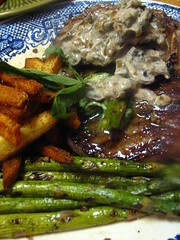 Add your fries and a side of greens (we used grilled asparagus). ENJOY! 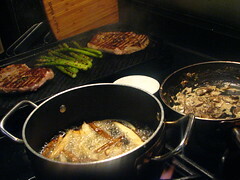 NOTE: We also got a bit more indulgent with this meal but sprinkling some white truffle oil we bought in Italy all over the asparagus and on the meat/fries. It was so good. Your dinner looks awesome. Wow!